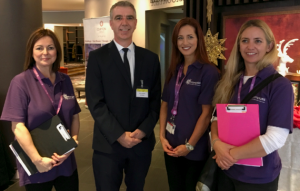 Director of the encompass Programme, Gary Loughran, with some of the encompass team(from left); Bronagh Keatley, Laura Molloy and Ella Jameson. The encompass programme is currently in the process of procuring a supplier who will deliver and implement an electronic health and care record across HSC. As part of this process over 270 staff from health and social care Trusts and patient representatives attended a series of evaluation sessions to help shape and transform future digital health and social care delivery in Northern Ireland. Held in Belfast, the sessions were an unprecedented opportunity for staff, carers and service users to be involved in the encompass selection and evaluation process. The four day event aimed to ensure that the new system is selected and designed by those who will use it to deliver our health and social care services. As part of the evaluation process four suppliers demonstrated their systems through a variety of scenarios previously developed by HSC staff. The encompass solution will be a single record which will replace, modernise and consolidate many of HSCNI’s old, fragmented and isolated systems. Considered one of the largest investments in digital technology in Northern Ireland, the new system will allow healthcare professionals to access patient information on a range of devices including handhelds such as iPads and mobile phones, wherever they are, safety and securely. They will also be able to update records in ‘real time’, make notes electronically, prescribe medicines, order tests and communicate with patients and users. People will be able to view their own information and communicate electronically with those who provide their care. Gary Loughran, Director of the encompass Programme, said he was delighted with the enthusiasm and energy from those who attended, with patients, carers and HSC staff coming together to make decisions which would benefit all. “I would like to thank all those who participated in the event, it was amazing to see HSC come together collectively to support encompass and especially those patients and carers who took the time to be here and contribute. This is a once in a lifetime opportunity to invest in the required digital capability to support transformation that is essential to deliver a first class health and social care service for people in Northern Ireland. It is anticipated that the successful supplier will be selected in spring 2019. The system is expected to be rolled out in each health and social care Trust area, starting in late 2020, with the last Trust completed by 2025.